Deanna Shrodes: Are You Preparing Your Child for the REAL World? Are You Preparing Your Child for the REAL World? If we're not careful, we can go from being our child's advocate to exerting undue interference that renders them unprepared for adult life. Years ago at our church, we had a pastoral staff member in their late twenties whose mother from out of state contacted my husband and me -- TWICE -- to tell us how she thought her son's work issues should be handled. Apparently she didn't agree with some of our decisions. We were absolutely dumbfounded. Needless to say, the interference on the part of the staffer's mother only made things go from bad to worse. Giving children opportunity to gain experience in solving problems of all kinds begins not when they turn 18 or 21, but all throughout their growing up years. Living in the era of helicopter parenting, many children and teens miss opportunities to learn problem solving skills. During the course of my children's school years we have had relatively few problems with teachers. I'm a huge fan of teachers, in general. But there were rare times when we didn't agree with something -- times when something may have been unjust or unwise. One day a teacher I'll refer to as Mrs. K, called me, and she was literally IN TEARS over the fact that Jordan was tapping on his desk, usually with a pencil. When Jordan finished his work and had nothing to do he would sit there tapping. Jordan doesn't do well when bored or with nothing to do. Did I mention, when she called she was CRYING about the tapping?? Profusely? I felt it was overly dramatic to say the least. When I got off the phone, I told Jordan how upset his teacher was over his tapping, and asked him to stop doing it. He said, "See, I told you she was crazy, Mom. What kind of teacher bursts out crying about tapping?" I could have called the principal and suggest that Mrs. K may need therapy. I could have requested he be pulled out of Mrs. K's class. I could have told Mrs. K she was a drama queen and ignored her from there on out. But I did none of that. I said, "Jordan, in life you're going to have to learn how to get along with all kinds of people. Chances are someone like Mrs. K is going to be on staff wherever you work some day. He or she may even be your boss. Mrs. K. is the authority in your classroom. And you need to learn how to respond to authority. For the rest of this year it's your job to obey Mrs. K and win her over." "Yep, serious as a heart attack, Jordan." "Well, you're gonna deal with a lot of crazy people in life, Jordan. So consider your relationship with Mrs. K part of your education." Larry and I made him work it out. He had to learn to deal with real life because real life was what was ahead, ready or not. The years have passed since that phone call with Mrs. K.
Both boys (now young men) have been quickly promoted, wherever they have worked. Their responsibilities increase all the time, as does their oversight of more people and projects. They know how to get along with all different people and personalities. We didn't swoop in to take over every time they had a problem. Neither would fathom me calling their workplace to interfere about anything. They have been equipped to deal with everything from meltdowns to injustice. Don't prepare the path for your child. 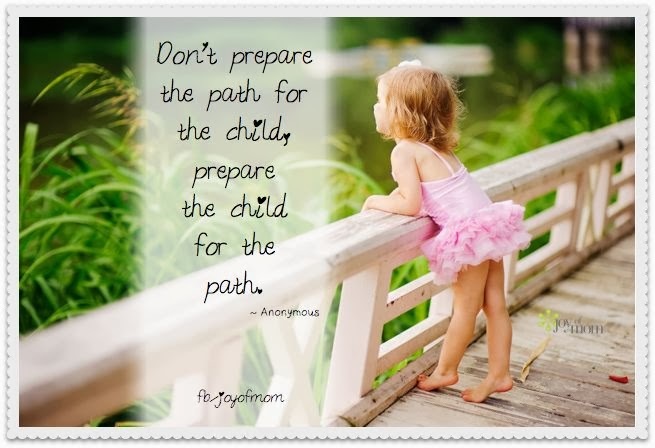 Prepare your child for the path.